Exceptional wet traction with outstanding all-season performance, handling, and long mileage. Designed for a broad spectrum of automobiles from compact to sport utility vehicles. 1. Casing profile design distributes internal stress evenly, creating a uniform tire contact patch on the road for long, even wear. 2. Two steel belts add strength and durability. 4. 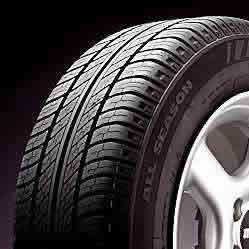 Advanced rubber compound remains pliable in all temperatures to provide excellent wet and snow grip. 5. Angled tread grooves keep noise to a minimum. 6. Three wide, circumferential tread grooves evacuate water straight through the contact patch while flared transverse grooves channel water out the sides of the tread, to combat hydroplaning and deliver outstanding wet grip. 7. Extra-long multidirectional sipes provide biting edges for traction in rain and snow. 8. Wide shoulder blocks develop more cornering force and lateral grip for crisp steering response.